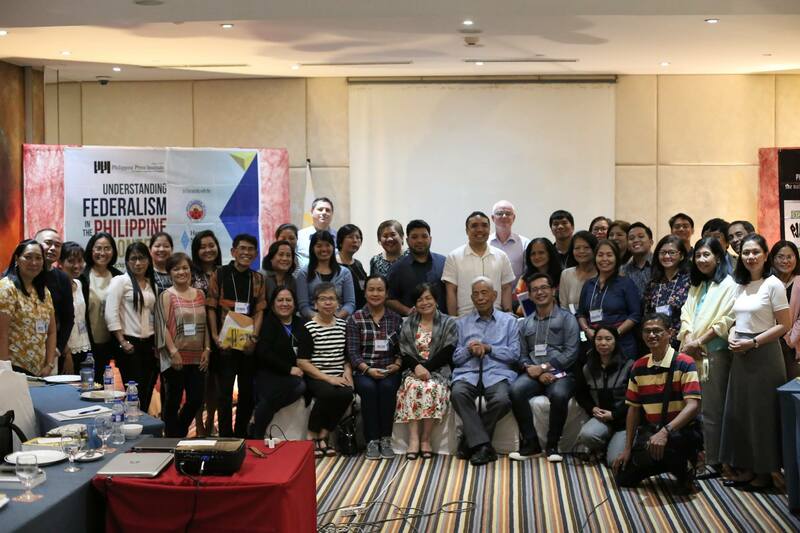 Journalists from Luzon and the NCR agreed that a Filipino or Filipinized type of federalism that acknowledges the country's diverse cultures, traditions, religions, and regional dynamics will be applicable to the Philippines. Amidst differing beliefs and apprehensions over the proposed federal form of government during the two-day seminar-workshop on Understanding Federalism in the Philippine Context conducted by the Philippine Press Institute (PPI) in Manila on October 11-12, with support from Hanns Seidel Foundation (HSF) and in partnership with the Pimentel Institute of Local Governance (PILG), thirty publishers, editors, and reporters expressed support for good governance no matter the form of government. "Let's look at the CAR experience. We"ve been talking about autonomy for the longest time. 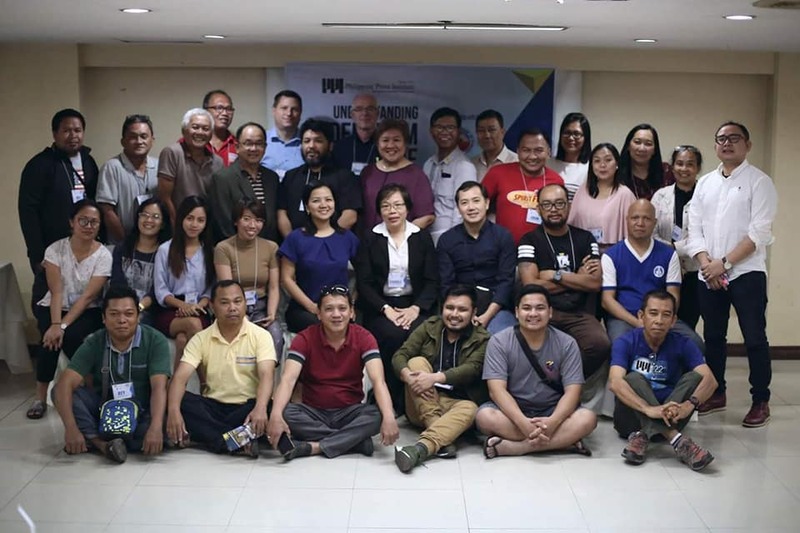 In fact, our different tribes up there are the ones very much affected with all these issues on having an autonomous region," said Sonia Daoas, PPI trustee for Luzon and director of the Cordillera News Agency (CNA), one of the eight participants from Baguio. 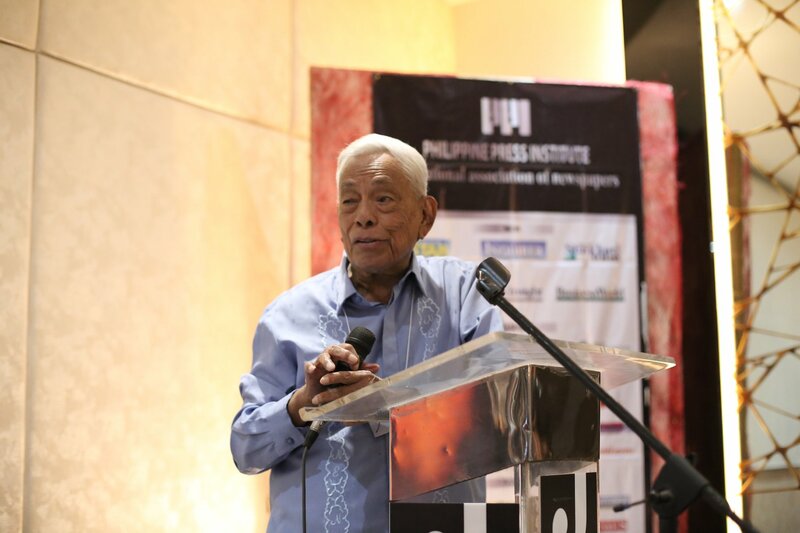 Former senator and senate president Aquilino 'Nene' Pimentel Jr., regarded by many as the Father of Local Government Code and PILG Chairman, a proponent of the draft charter on federalism, explained the context, logic, and aspirations of the measure that seeks to decentralize the power of the national government and share its resources to the regions. "Outside Metro Manila, our provinces get measly shares which I think is not fair," Pimentel said. Worries on the rise of political dynasties and nepotism if there will be federated regions, were clarified by Atty. Barry Gutierrez, a law professor at the University of the Philippines in Diliman, who discussed the salient provisions embodied in the draft constitution. “Sa 1987 na Saligang Batas, nakasaad lang po doon ang probisyon na nagbabawal sa political dynasty pero subject pa rin siya ng batas na dapat maipasa ng Kongreso. Pero sa bagong draft, sa probisyon palang ay nakasaad na kung sinu-sino ay hindi pwedeng kumandidato sa pamilya. Sa ngayon po ang nakalagay ay nasa up to 2nd degree ng kapamilya ng isang politiko,” said Atty. Gutierrez. Senator Pimentel who was one of the reactors to Gutierrez's presentation, said that the explicit provision on political dynasty seeks to end the commonplace dynastic politics and give chance to other candidates who are also qualified to run for any elective position. After an intensive discussion on the pros and cons on federalism as presented by the speakers and panelists, the participants during the group activity and writeshop listed story ideas such as economic benefits to the regions, delivery of basic social services, shortening of bureaucratic processes, swift delivery of justice, ridding multi-party system, taxation, police, electoral reforms, among others. "These are more of questions waiting and wanting for answers. The public needs to know all these things," said Janet Valdez, a journalism professor at the Bulacan State University whose family partly owns Mabuhay, a multi-awarded community newspaper. Valdez who presented her group's output stressed the need for better understanding for better reportage. 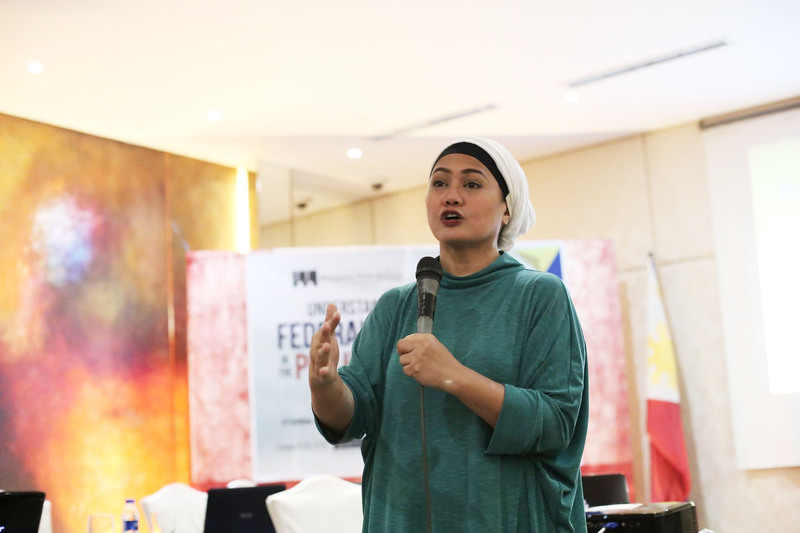 The challenge now, according to her, is to echo the information to the grassroots, with local government units, civil society organizations, non-governmental organizations, academe, and media organizations doing their fair share in informing and educating the public about federalism. "The role of the media is to inform, educate, and stimulate critical thinking." 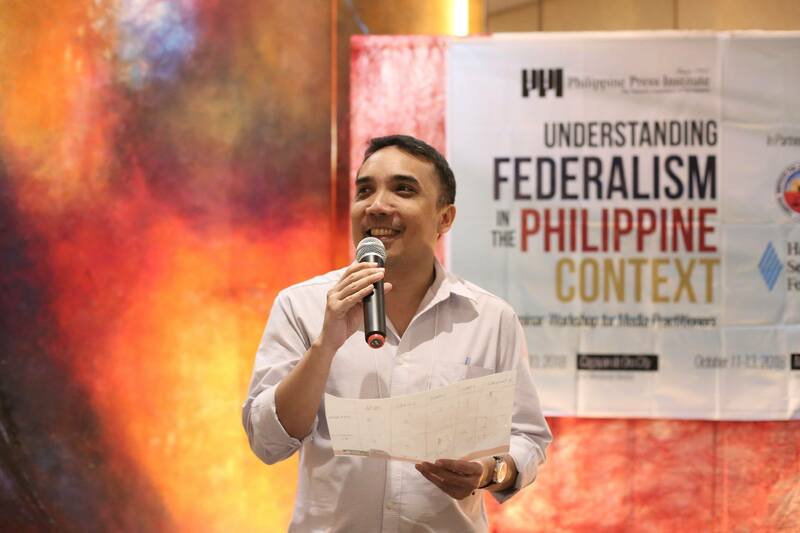 Journalists from Mindanao has challenged the Philippine government to explain thoroughly the details of federalism for the general Filipino public, this despite the seemingly high level of awareness of Mindanaoans on the proposed form of government as campaigned by President Rodrigo Duterte when he assumed the presidency in July 2016. The context of a federal form of government has been occasionally discussed by President Duterte in his public speeches but details such as sharing of powers between the national and regional government, taxation, and transition have not been fully explained. In a seminar-workshop for media practitioners in Mindanao in Cagayan de Oro on October 8 and 9 on Understanding Federalism in the Philippine Context organized by the Philippine Press Institute (PPI) in partnership with the Pimentel Institute for Leadership and Governance (PILG) with the support of Hanns Seidel Foundation (HSF), both participants and resource persons asked about the readiness of the Philippines to have federated regions and its implications on various facets such as judiciary, health care system, and natural capital, among others. Majority of the thirty participants who attended the seminar-workshop agreed that there are gaps in communicating federalism to the public because of the weak communication planning of the government. "On one hand, they said it's going to be costly. Talking about cost but what about its benefits?," said political strategist Malou Tiquia, founder and chief executive officer of Publicus Asia, Inc. She said that the present government failed to define federalism and explain its implications on the lives of the common Filipinos. “Will it change my life? Will it serve better justice? Hindi ito masagot sa federalism. Only economic and political powers ang concern nila.” She challenged Mindanao journalists to communicate the Mindanao narrative. Seasoned journalist Butch Enerio, correspondent of SunStar Cagayan de Oro, admitted the dearth of reports on federalism and acknowledged the importance of understanding the basic information about federalism in the local media so they can expound and articulate the issues to their readers or listeners. “We need to be updated as well. You see there are various types of federalism. Journalists must study federalism so there will be minimal errors once we convey the information to the public,” Enerio said. Rodolfo Vicerra, an expert on congressional planning and budgeting explained the comparison between the draft by the Constitutional Commission (ConCom) and the present 1987 Constitution. Vicerra said there are minimal changes in the provisions of the 1987 Constitution that were found in the ConCom draft. “Maybe if you could multiply the Ombudsman into different regions mapapadali ang investigation sa mga cases against erring officials, but right now under the unitary system, it is now monopoly of the Ombudsman,” said Vicerra citing weak points on Accountability of Public Officers. Former journalist and now executive director of the Center for International Law, Atty. Romel Bagares on his reaction to the salient provisions of the draft charter, observed the absence of mutual communication between the government and the public. “Right now, 75% of Filipinos are not aware of federalism. There’s an absence of mutual communication. Federalism was designed to unite and not to divide," Bagares said. "Pre-conditions should be set so it can take off but it will take time, say 15-20 years." Another challenge that he sees is the funding source of the implementation of federalism that according to the Department of Finance (DOF) would cost P300 billion while Department of Interior and Local Government (DILG) pegged it at P15 billion. With unresolved issues surrounding the proposal to change the form of government, Mindanao journalists believed that the government should study the proposal well, identify the model of federalism suited to the Philippines, explain in details its aspects, and not rush things. "Äfter all, only Mindanaoans can charter their own course," Enerio said in a hopeful tone. 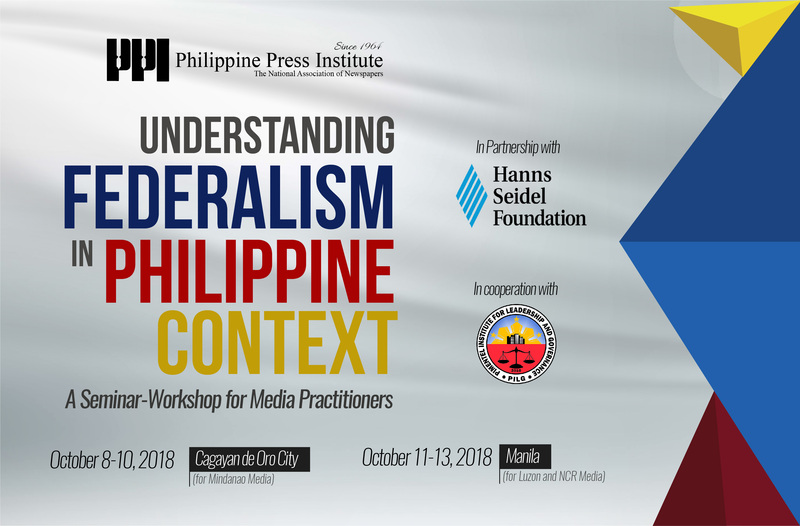 The Philippine Press Institute (PPI), also known as the national association of newpapers, in partnership with the Pimentel Institute for Leadership and Governance (PILG) and with support from the Hanns Seidel Foundation (HSF), a non-profit association funded mainly by the Federal Government of Germany, will conduct two seminar-workshops for journalists on Understanding Federalism in the Philippine Context on October 8-10 in Cagayan de Oro City for Mindanao media and October 11-13 in Manila for Luzon and NCR media. The workshops aim to discuss the salient points of the draft charter on federalism, significant aspects and characteristics of a federal form of government, and various issues surrounding the proposed federalism such as the allocation of authority and power between national and state governments. taxation, and management and distribution of natural resources, to name a few. The Peace Process and Bangsamoro Organic Law (BOL) will also be presented. Thirty journalists for each leg are expected to participate in the two-day seminar whose program includes a group activity, a panel discussion, and a mini-press conference. 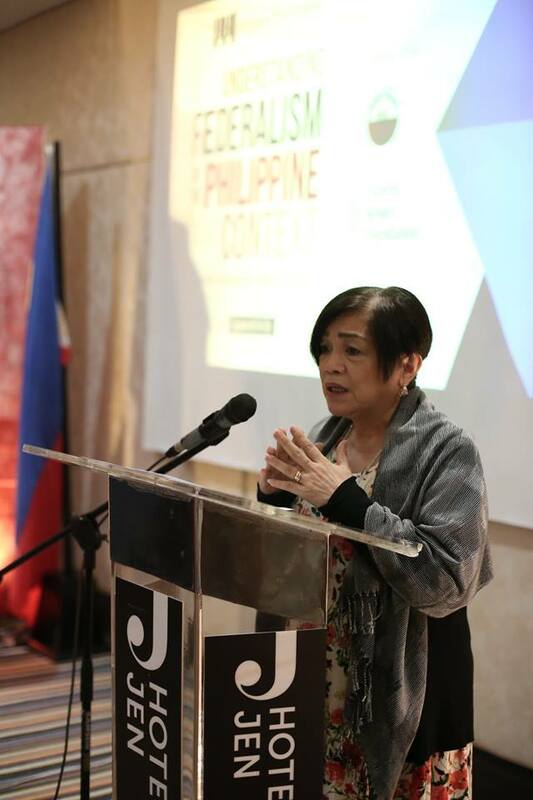 PPI executive director and trustee Ariel Sebellino said that the activity is the first ever media-initiated seminar-workshop for journalists that will focus on the draft charter. "We want to contribute to the discourse and in a way, educate the public and engage stakeholders for insightful discussion," he said. Sebellino added that there's more to it than just the pros and cons. "We are not promoting it or campaigning against it." Former Senator Aquilino 'Nene' Pimentel Jr., regarded as the father of the Local Government Code, in support to the Proposed Recommendations of the Constitutional Committee for the Adoption of the Federal System of Government for the Republic of the Philippines, believes that both Christians and Muslims including the indigenous peoples will benefit from the federated regions. "I am confident that law and order, leading to peace and development will follow as a matter of course,” Pimentel. He lauded the Constitutional Committee for its recommendations that "now place the right of our people to modernize our country and develop themselves at the doorsteps of the citizens of our Republic who are residing in the proposed Federated Regions". Among the more outstanding provisions recommended for inclusion in the new Constitution, he said, are the articles that assure our people actual and speedy delivery of justice. "For delay in the delivery of justice is one of the most pressing problems of our land. And without justice, our living lives worthy of human beings would be impossible,” Pimentel added. Pimentel will be the pro-federalism panelist in the Manila leg. Joining him in the panel are Malou Tiquia of Publicus Asia and Atty. Romel Bagares of the Center for International Law. Goetz Heinicke, Resident Representative of the Hanns Seidel Foundation in the Philippines said that Filipinos have to decide whether or not federalism makes sense for the Philippines. "As a foreigner and visitor to this country, I cannot and I do not have to answer this question. But I am quite proud to come from Germany, a federal country, in which Bavaria, “my federal state,” has developed from the poorest state after WWII to the best, richest and most attractive one today, thanks to the Federal System that we introduced in our new Constitution in Germany after the war," he said. Heinicke also believes that the shift to a federal system cannot be done by somebody alone and means hard work and engagement for everyone, especially for the civil society. President Rodrigo R. Duterte has declared his intention to change our current form of government to a federal form. A consultative committee was formed to study this option and elicit public support.